On Friday, I hosted a party at my home for the first time in three years. It was a jewellery party fundraiser. The jewellery was Jolica, which my friend Amanda has just started selling. The "company that gives back" concept seems to have been taken many levels above what I have seen any other home-based business do with this one, and I can see why Amanda chose to support it. The fundraiser was to support some family friends, who are going on a missions trip to Jamaica in the New Year. The living room was full of smiling faces, the air was full of the smell of spiced hot apple cider and women laughing, and my home was full of warmth. Thank you, ladies (you know who you are), for helping that to happen. 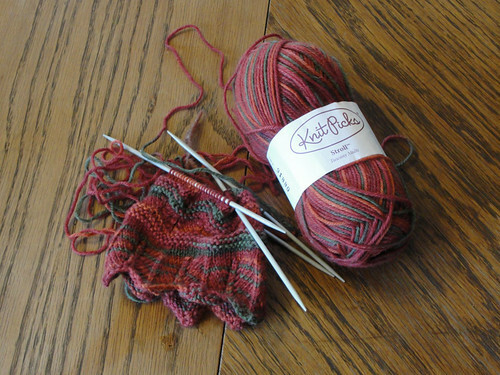 Last weekend, I started my twelfth pair of knit socks ever. (I only started knitting socks in February 2010.) These are the first ones I've ever made for myself. (I figured it was high time, and my chillified toes agreed.) Since I had just got this fun yarn, whose colours make me swoon (and which has the romantic name of "Tuscany", from which culture's goddess of love my name is derived), I thought I would try something a little different than the 3/1 rib which is my go-to standard for quick socks for my kids. Branching out is good--I chose this pattern because I was hoping the yarn would stripe. It didn't. Oh, well--it still seems to be complementing the yarn nicely. And I am so thrilled at the idea of having my own pair of hand-knit wool socks! Tonight, my mother took me to a gala dinner for women put on by one of the local churches. I have never been to the "Crimson and Ice" event before, although I had heard it was lovely. Many of my friends were there, the decorations were amazing, the music was relaxing and inspiring, and it was so nice to have a wonderful dinner in the company of so many beautiful women. I haven't had this much "girl time" in a long time--and it's been wonderful. It has given me a renewed sense of appreciation for the amazing women in my life. Thank you, ladies--whether I know you well or only a little, your beautiful spirits minister to me, for I see a piece of God in you. I hope that you, too, get to have a little bit of pampering this week. Somewhere in my very full life, I write. I tell stories with words and pictures. To hear my music or read my works of fiction, go to www.talenawinters.com. Your socks will be awesome....and yes, it was high time you made yourself a pair! I agree on the amazing women's dinner last night. Beautiful, uplifting, and the BEST company!! Thank you for commenting today! I want to make sure you get my reply. Make sure you sign up for follow-up e-mails on this post, as I will be replying to you in the comments section here! Creator of beauty with words and music and pictures and pretty string. Lifelong tea addict. Abundantly blessed wife and mother of 4 boys. Hear my music or read my books at www.talenawinters.com. Do you read, knit, or eat? Join the club! Like My Secret Wish by Talena on Facebook! Talena Winters is a participant in the Amazon.com.ca, Inc. Associates Program, an affiliate advertising program designed to provide a means for sites to earn advertising fees by advertising and linking to Amazon.ca.